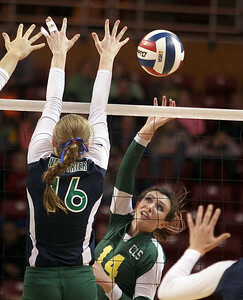 Sarah Nader - snader@shawmedia.com Crystal Lake South's Emma Burkle (left) taps the ball over during Saturday's third-place match against New Trier at the IHSA Class 4A state final at Illinois State University in Normal, IL November 16, 2013. Crystal Lake South lost to New Trier and finished fourth place at state. 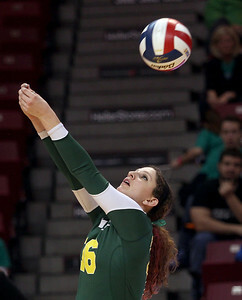 Sarah Nader - snader@shawmedia.com Crystal Lake South's Avalon Nero hits the ball over during Saturday's third-place match against New Trier at the IHSA Class 4A state final at Illinois State University in Normal, IL November 16, 2013. Crystal Lake South lost to New Trier and finished fourth place at state. Sarah Nader - snader@shawmedia.com Crystal Lake South's Nicole Slimko sets the ball during Saturday's third-place match against New Trier at the IHSA Class 4A state final at Illinois State University in Normal, IL November 16, 2013. Crystal Lake South lost to New Trier and finished fourth place at state. 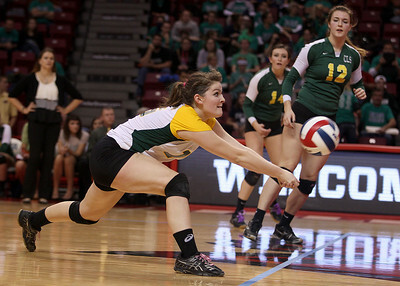 Sarah Nader - snader@shawmedia.com Crystal Lake South's Hannah Wilson dives for the ball during Saturday's third-place match against New Trier at the IHSA Class 4A state final at Illinois State University in Normal, IL November 16, 2013. Crystal Lake South lost to New Trier and finished fourth place at state. Sarah Nader - snader@shawmedia.com Crystal Lake South's Nicole Slimko dives for the ball during Saturday's third-place match against New Trier at the IHSA Class 4A state final at Illinois State University in Normal, IL November 16, 2013. Crystal Lake South lost to New Trier and finished fourth place at state. Sarah Nader - snader@shawmedia.com Crystal Lake South's Carly Nolan makes contact with the ball during Saturday's third-place match against New Trier at the IHSA Class 4A state final at Illinois State University in Normal, IL November 16, 2013. Crystal Lake South lost to New Trier and finished fourth place at state. Sarah Nader - snader@shawmedia.com Crystal Lake South's Cassy Sivesind (center) celebrates a point during Saturday's third-place match against New Trier at the IHSA Class 4A state final at Illinois State University in Normal, IL November 16, 2013. Crystal Lake South lost to New Trier and finished fourth place at state. 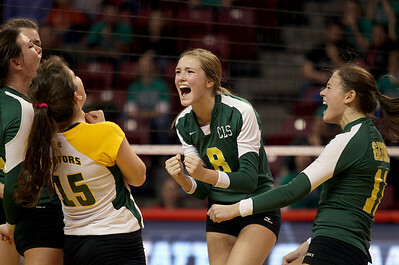 Crystal Lake South's Cassy Sivesind (center) celebrates a point during Saturday's third-place match against New Trier at the IHSA Class 4A state final at Illinois State University in Normal, IL November 16, 2013. 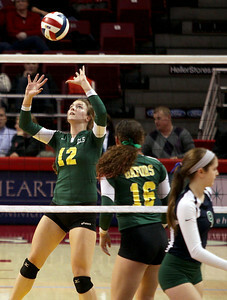 Crystal Lake South lost to New Trier and finished fourth place at state.